Thanks to "Murray B. from Canada" for adding balance. Many countries have national mythologies, and these myths can take on a life of their own, though initially inspired by actual events. The CF-105 Avro Arrow is part of Canada's national mythology. 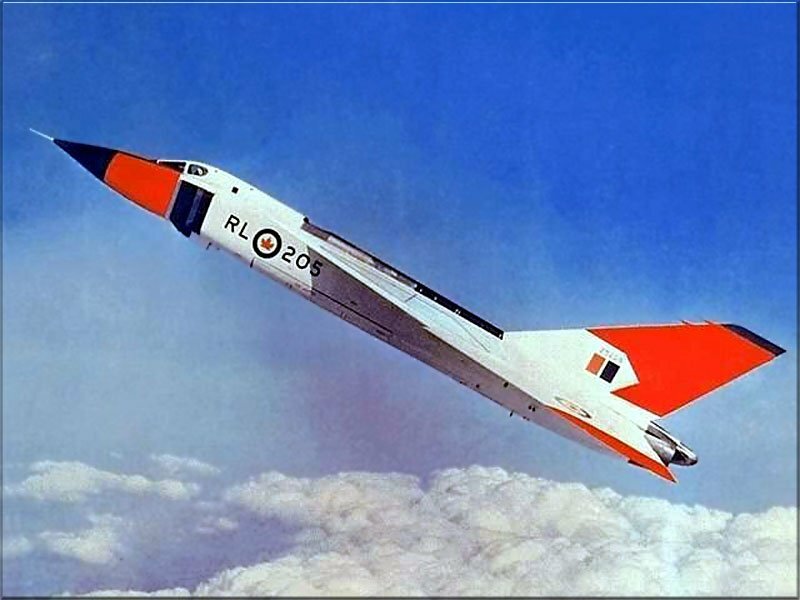 By the time Avro moved into design and construction of the CF-105 Avro Arrow in the mid 1950s, the twin-engined delta-winged supersonic jet interceptor was classified as Top Secret and there were only a few people in the world that knew much about it. The Arrow was considered by later admirers the most advanced aircraft of its time, while Aerospace Engineering Professor Julius Lukasiewicz, who was familiar with the design, described it by saying, "there was nothing extraordinary about it." The controversial decision is the stuff of Canadian mythology, taking on all the accompanying conspiracy theories one would expect. The Avro Arrow has become possibly the world's most overrated aircraft. It is not difficult to discover the facts about the aircraft but most information sources today publish fiction about it from what young people would call Arrow fanboys. This aircraft is obscure because it had its official rollout on 4 October 1957, the same day the Soviets launched the first Sputnik. But if Professor Lukasiewicz was correct, then it may have remained obscure even if Sputnik had not been launched at the same time. Some Canadian airman do not want to be reminded of what happened to the Avro Arrow, but the airmen who flew Voodoos seemed to have liked them just fine. The CF-105 Arrow was to be the crowning achievement of the Canadian aerospace industry. Only five Arrows flew before the project was cancelled by the Canadian government on February 20, 1959. The CF-105 Arrow project was cancelled as part of the Commonwealth's decision that the Bomarc missile made the Arrow obsolescent. But Voodoos and Bomarcs were purchased instead of Arrows, so it is unclear why the Voodoo would not have been considered obsolescent as well. Canada's first jet fighter, the CF-100 was a subsonic aircraft. Although the CF-100 Canuck project was a success, it was decided that a new all-weather, supersonic jet interceptor would be required to meet Canada's expanding defense needs. The design of the CF-105 Avro Arrow began in 1953. Due to the vast territory of Northern Canada and the threat of Soviet nuclear bombers coming over the Pole, the Canadian Air Force issued a request for proposal for a Mach-2-plus interceptor that could execute a 2g turn at 50,000 feet without losing altitude. In addition, it had to deliver a large payload of air-to-air missiles under ground control. These specifications exceeded the capabilities of any fighter, in service or in planning, worldwide. It should be noted that the Canadian Government chose to purchase the aircraft without a competition, and then asked the military to draft a detailed specification for it. There is no record of competing designs, so it does not appear to be a RFP in the normal sense. Avro proposed a large aircraft (about as long and tall as the Lancaster bombers it had built in World War II) with a high-mounted delta wing, and a skyscraper vertical tail. The Arrow was designed without knowledge of the area rule and then modified as the information was made available. According to the Avro Mk. 1 brochure Avro only applied the rule to the nose, engine inlets, and tail section. It was area ruled to a degree, but Avro left most of the fuselage straight so the Arrow did not have a "coke bottle" shape. Throughout the 1950s, Avro was working on this new, supersonic interceptor. In 1955 the US Air Force established a requirement for a 'long range interceptor" aircraft (LRI) having similar characteristics to the RCAF specification for the Arrow issued in 1953. The US aircraft industry became alarmed by the prospect that they might lose a major USAF procurement contract to Avro Canada. The U.S. authorities made it quite clear that they did not intend to buy any CF-105s. Their own F-106C was comparable in performance to the CF-105, it would be available for squadron service several months earlier, and it cost less than half as much. The U.S. was also developing the F-108, a huge aircraft with a range of approximately 1,000 miles. Some claim that the Arrow was one of the fastest fighters in the world at the time, with a top speed Mach 1.96 [1.98 according to the pilot] for a short period of time. There seems to be no documentation of any speed record for the Arrow but if it did set any then it was only for a few months. The F-104 Starfighter was a contemporary Mach 2+ rated aircraft. Some sources claim the fastest an Arrow flew was 1,650 mph, but other sources report the fastest speed as 1,524 mph. The Arrow with Mach 1.9 continuous speed rating did not meet the original Mach 2 speed specification [it did meet the later revised Mach 1.5 requirement]. The estimated 1254 nm ferry range for the Arrow Mk. 2 did not meet the range requirement. Its best turn was 1.25g with loss of speed and altitude which did not meet the 2g turn requirement. An advanced specification does not mean the aircraft is advanced if the aircraft does not meet the specifications. This was a fine piece of machinery intended by its makers to become the primary fighter intercepter of North America for the 1960's. Part of the mythology of the Avro CF-105 Arrow was that it used a computer-based fly-by-wire (FBW) control system, and was the first aircraft to do so. The Arrow used a hybrid transistor/vacuum tube analog FBW computer. Unshielded transistors in the FBW computer were probably not an advantage for an aircraft intended to intercept nuclear bombers. At least the F9F had used an analog computer FBW system earlier so the Arrow could not have been the first. The Arrow prototype was built using the same tools and rigs that were to be used on production Aircraft, eliminating the expensive practice of building flight test prototypes by hand. In addition, it meant that the production run could be started immediately following flight test acceptance of the design. The CF-105 was built to provide Canada and NORAD with the most advanced air defence fighter in the world. Modern supporters claim the Arrow was a very clean design and that many of its features were copied on other North American-made fighters, including today's F-22 Raptor. But if clean means low drag then the Arrow was not as clean as many competing designs. And claiming that anything about the F-22 is "copied" from the Arrow is totally off the mark. Today, supporters of the Arrow never tire of claiming that it was one of the world's most advanced airplanes in its day, considered by "many" to be twenty years ahead of its time. There were also many that thought the aircraft four or five years behind the times because of the straight fuselage. Twenty years from cancellation would be 1979 and the Arrow is simply not in the same league as the best aircraft of that era. Like most similar aircraft of the fifties the Arrow was a metal skinned aircraft with primarily vacuum tube electronics. Most comparable aircraft of the late seventies had polymer composite skins with transistor and integrated circuit electronics. The newer aircraft are at least a generation beyond the Arrow in capability.